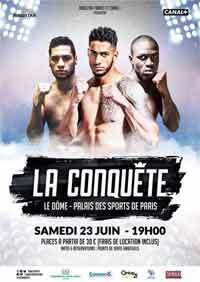 Review by AllTheBestFights.com: 2018-06-23, pretty good fight between Tony Yoka and David Allen: it gets three stars. The 2016 Olympic super heavyweight gold medalist Tony Yoka entered this fight with a professional boxing record of 4-0-0 (3 knockouts) and he is ranked as the No.59 heavyweight in the world. In his previous bouts he has won over Travis Clark (Yoka vs Clark), Jonathan Rice (Yoka vs Rice), Ali Baghouz (Tony Yoka vs Ali Baghouz) and Cyril Leonet (Tony Yoka vs Cyril Leonet). His opponent, David Allen, has an official record of 13-3-2 (10 KOs=77%) and he entered as the No.105 in the same weight class. He lost to Lenroy Thomas last year (via split decision) but then he has beat Tom Dallas and David Howe but he has also faced Thomas again in 2018 (bout ended in a draw). Yoka vs Allen is the main event of the evening. Watch the video and rate this fight!